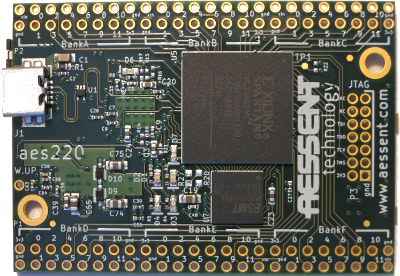 As you may already know the aes220 is a high-speed USB FPGA module for rapid prototyping with an emphasise on simplicity. 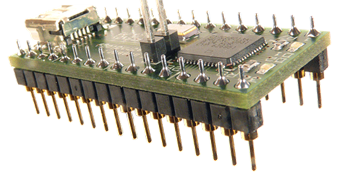 It is ideal for learning and at the same time powerful and compact enough to be used on its own or integrated among other applications.Keeping the VHLD and C/C++ libraries aside the simplicity of it also lays in the fact that only an USB cable is required to be able to power, program and communicate at 480Mb/s with the FPGA. 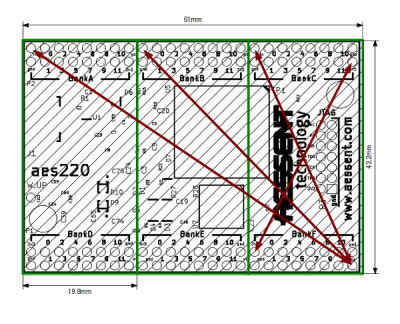 Simplicity is again reflected in its ports arrangement which is of great help when it comes to connect the board to other hardware and this is what I am going to describe here.The two Ports are located on each side of the board and give direct access to the FPGA pins. There is a total of 72 IO also called GPIO (General Purpose Input and Output). The pins are placed at 2.54mm (0.1”) from each other and the connectors are located at a multiple of that value too. That way it is easy to make a prototype board with a simple Vero board. Inter-spaced with these GPIO are power supply pins: ground, 5V in and 3.3V out. The placing of these power pins allows to pass on power to daughter boards even smaller in size than the aes220. A third of the size in fact since 3 slots are provided. Pinout wise these slots are identical so it doesn't matter which slot is used. Furthermore these pins are placed symmetrically across the board, this way you can plug in your daughter board in any direction on any of the 3 slots without having to worry about power supplies. 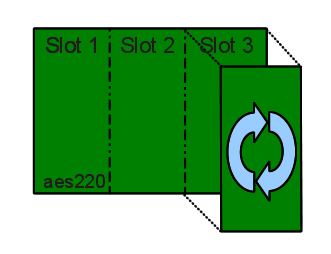 This incidentally is also true when stacking up two or more aes220 which will be the subject of another blog. Note that when the power is fed externally we can disconnect the USB cables. The board will still run and boot as normal with just the external supply. So if the application doesn't require USB communication then the power can be provided solely via the ports.From this it is easy to see that an interface to the Raspberry Pi GPIO or a Pmod module is just a matter of placing the proper connector on a tiny piece of Vero board. Incidentally to make it even easier some of these interface boards are already under way, so watch this space!